In attempt to provide Broadband Internet connectivity at affordable rates to the peoples of Mumbai, Mahanagar Telephone Nigam Ltd (MTNL), cities largest Broadband and total telecom service provider, today announced the launch of a new fully Unlimited Broadband plan at just Rs.395 with 320 kbps downloading speed. MTNL’s DSL Unlimited Broadband -395 plan comes at monthly rental of Rs.395 along with Rent free DSL Modem and High Speed Broadband connectivity at 320 Kbps. The new Unlimited plan will be available form today i.e 15th June 2010. The existing MTNL Broadband customers are allow to migrate in this plan or any other Broadband Plan at any time during the month just by migration request on toll free number 1500 from MTNL land line. MTNL provide always ON, faster Connection with dedicated bandwidth of minimum guaranteed 256 Kbps on its ADSL2+ technology. 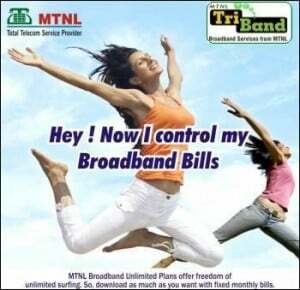 With the Triple Play MTNL Broadband (Triband), subscriber can talk on phone and surf Internet or play on-line game at the same time. PLEASE GIVE ME SOME SUGGESTION FOR NETT AT HOME.